Enterprise arrives at Sarpeidon three-and-a-half hours before its star, Beta Niobe, goes supernova, only to discover that the planet has already been evacuated. Where everyone has gone is anyone’s guess, since Sarpeidon hadn’t yet discovered space travel. A strong power reading on the surface leads Captain Kirk, Mr. Spock, and Dr. McCoy to some sort of archive, where they are greeted by an old librarian, Mr. Atoz. The poor guy is so happy to have patrons to serve, he doesn’t even notice they’re out-of-towners or bother to check their library cards. Kirk asks him where everyone went, but Atoz is too senile or focused on helping them to give him a straight answer. ATOZ: It depended on the individual, of course. If you wish to trace a specific person, I’m sorry, but that information is confidential. MCCOY: No, no particular person, just people in general. Where did they go? ATOZ: Ah, you find it difficult to choose, is that it? Yes, a wide range of alternatives is a mixed blessing, but perhaps I can help. Would you step this way, please? To combat a devastating botanical plague that threatens the non-botanical life on Merak II, Enterprise heads to Ardana, a Federation world that possesses unobtainium zenite, the only thing in the universe that can save the trees. Upon arrival, they’re invited to the cloud city Stratos for an audience with the High Advisor Plasus, but they’re in too much of a hurry for pomp and circumstance. Captain Kirk and Mr. Spock beam down directly to the zenite mine entrance to pick up the prescription they ordered from drugstore.com and get on their way. However, they do spare some time to gaze admiringly at the city floating above and discuss its utter devotion to art and purely intellectual pursuits. As development ramps up on the untitled sequel to the 2009 Star Trek reboot film, plot and casting rumors are as inevitable as Vulcan ponn farr. J.J. Abrams, Alex Kurtzman, Roberto Orci, and Damon Lindelof are still working on the script, but people are already conjecturing about the possible storylines and characters we’ll see as early as June 2012. 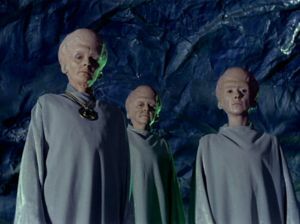 The latest revelations, according to Trekmovie.com and Badass News, dangle the possibility of a classic Trek antagonist challenging the crew of the Enterprise. It seems many fans would happily go where we’ve gone before with a modern take on “Space Seed” and the return of a pre-wrathful Khan Noonien Singh. 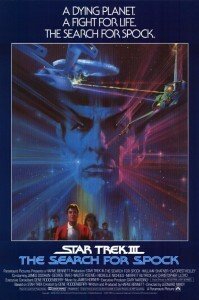 I think that would be a mistake given the iconic nature of Ricardo Montalban’s performance and the fact that the original Star Trek II has pretty big boots to fill. Come to think of it, “Space Seed” itself is a tough act to follow. 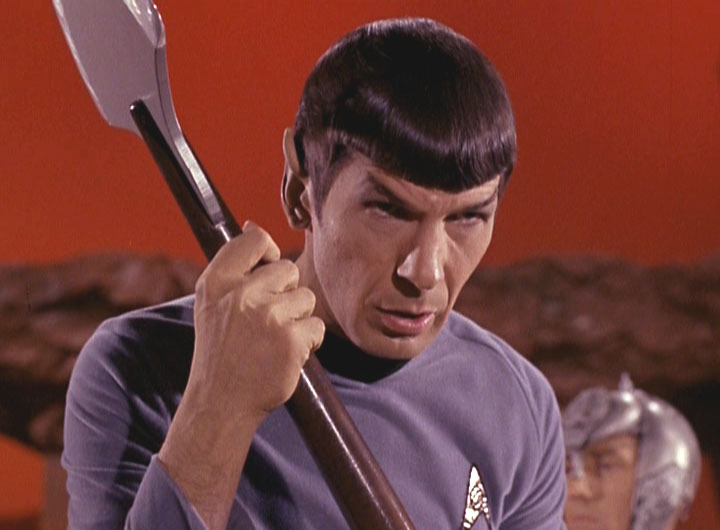 Something’s wrong with Spock! 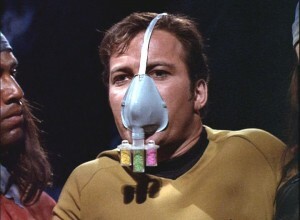 At least that’s what Dr. McCoy thinks, since Spock hasn’t eaten in three days and he’s a little edgy. Captain Kirk assumes his first officer is just being moody again, even after Spock throws a bowl of plomeek soup at Nurse Chapel. 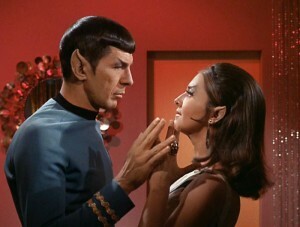 But then the Vulcan requests a leave of absence to visit his home planet, which definitely demands explanation. Spock claims Chapel deserved mistreatment for being nice enough to bring him homemade soup that he didn’t ask for, but Kirk couldn’t care less about his misogynistic opinions, he’s more interested in the request for shore leave: “In all the years that I’ve known you, you’ve never asked for a leave of any sort. In fact, you’ve refused them.” Spock won’t share his reasons, but it seems pretty important and he obviously needs a vacation. The usually controlled Vulcan can’t even keep his hands steady. Kirk finally agrees to divert the Enterprise from its mission to Altair 6.